Its not often that a show touches your heart and is so endearing. But this show was just that. It took a year and a half for the show to be put together. It appeared that The Call’s music was not the easiest to learn, but Robert did one hell of a job to follow in his father’s foot steps. Robert Been, bassist and singer of Black Rebel Motorcycle Club, came together with his father’s band The Call to perform their music. It was one of two shows that the band will be playing. His father, Michael Been, died a few years back on tour with his son’s band. It was sudden and way too soon. So this was a perfect tribute to his father, bassist and singer, of The Call. The band seemed very excited to be playing. Their music still sounded incredible and they definitely still knew how to rock. Their 80s alternative U2-esque sound was amazing as they opened up the set with ‘Everywhere I Go’. The crowd was enthusiastic with lots of cheers. 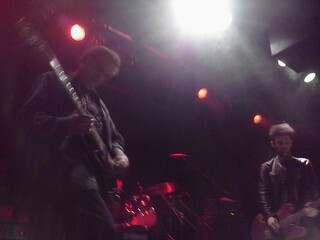 Tom (Dickie), the guitarist, was right in front of me clad in a BRMC shirt. It was fitting and he was full of smiles. He smiled at me a few times, easily one of the younger people in the audience. The guys next to me were pumped up as they yelled out songs and talked about their first time seeing the band. Scott, the drummer, was on top of it, pushing the band through the music. Jim was great on keyboards, having a really fun time. The band seemed to be racing through songs and they all sounded incredible. While I only recognized a handful of songs, it was easy for me to want to be there to support this special night. Their songs are easy to get into and their music still has a current sound to it. The gents next to me gave Robert a hard time about messing up a few of the songs. Robert was cute and nervous and some of the songs were clearly more difficult than others. One of my favorite bits of the night was the crowd heckling him for not quite getting the songs right. He commented on how hard they were to learn and why it took so long for them to have this night. He told a heart warming story about his dad’s bass being stolen. Then one day he gets a call from a pawnshop in Santa Cruz with the owner being a huge fan of the Call and realizing that it was Michael’s bass. It landed back in Robert’s hand and he’s been playing it. He comments about it being very hard to stay tuned, but that it was special. I was beyond excited to hear ‘Let The Day Begin’. I had recently heard it when BRMC had played it, but it was just incredible to hear the band play it. The crowd sang along and clearly was having a great time. The lyrics still seem so relevant. The set ended with ‘Walls Came Down’ and it sounded even better live. With everything that had been going on, the song just seemed so fitting. They ended the set with Uncovered which was just Robert singing and it was just hauntingly beautiful. It was great that they kept playing and didnt leave the stage right at 11. They pushed on and said to hell with last calls/closing times. Its a joke anyway – I sure dont remember this when I last lived here. (Apparently its a new thing – with some place moving in and wanting to change it up – thank you gentrification). Robert definitely tried his hardest and wanted to please the band and his fans. A guy commented next to me, ‘well he’s definitely not his father, but he’s holding his own’. Robert sounded great and albeit a bit nervous, he was clearly having fun. The guys were all good natured and poking fun at him. His father definitely had to be smiling down at him. The band clearly missed Michael but this was the best tribute anyone could have asked for. It was just heartwarming and endearing and Im glad that I got to be there to be a part of it. 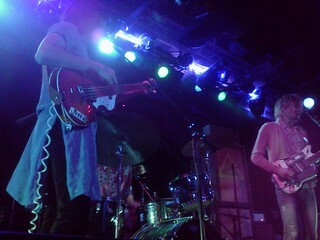 Jeffertitti’s Nile, the opener, is a 4 piece band from LA and a friend of Roberts. The lead singer came out clad in skin tight jeans, that looked like they were painted onto him. He had a mop of blonde hair hanging in his face reminding me of a surfer. But a surfer band they were not. The other guys came out in long shirt/dresses and pants and longish hair stepping out of the 60s. It was fitting that they played psychedelic-garage-bluesy-glam rock. They kind of flowed all over the stage. The real awesomeness was the drummer and his hair which exceeded Brent (fathead of The Dandy Warhols). This guy had the most awesome head of hair, only sadded by the fact that the drums hid it. People seemed to really enjoy them. They were pretty quiet with not much to say, and when they did say something it was all distorted through the mics. This is one band that I cannot wait to see again. This entry was posted on April 22, 2013 at 7:55 pm	and is filed under Adventures in the Big City, Live Music, Random Ramblings, San Francisco. Tagged: 80's, alternative, Black Rebel Motorcycle Club, BRMC, concert, indie, Jeffertitti's Nile, LA, live, Michael Been, music, psychedelic, Robert Been, San Francisco, Santa Cruz, SF, The Call, U2. You can follow any responses to this entry through the RSS 2.0 feed. You can leave a response, or trackback from your own site.